Now it’s for real. Every time Mitt Romney or Barack Obama hits a rhetorical high note or commits another blunder, millions of voters watching and listening out there have the power to sit down at home, fill out a ballot, drop it in the mail and be done with the 2012 presidential race. At least a third of American voters probably will lock in their choices before Election Day arrives on Nov. 6. The old democratic ritual of a single Tuesday in November when citizens commune in lines at schools and libraries and churches is fading across much of the United States. Why not just mail it in? Although the two candidates have yet to meet for their first debate, voting by mail is under way in two dozen states, with more to follow. In three _ Idaho, South Dakota and Vermont _ voters already can show up in person. Wyoming begins its in-person voting on Thursday and so does Iowa, one of a handful of states considered up for grabs in the neck-and-neck presidential race. In some of the other hotly contested states _ Colorado, Nevada, North Carolina and Florida _ more than half the ballots are expected to come in early this year. Stretching voting out over six weeks makes the high-wire act of presidential campaigning that much more complicated. It presents risks but also rewards for the candidates, as Obama proved in 2008 through an aggressive early mobilizing strategy that overpowered Republican challenger John McCain. 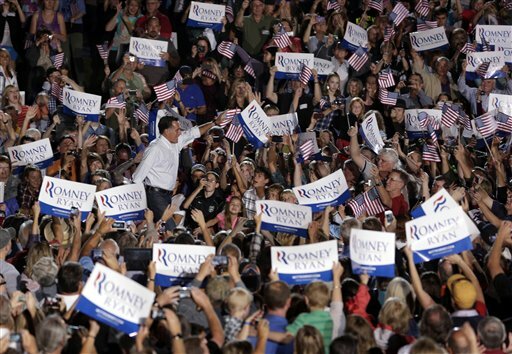 This year looks different: The Romney campaign is pouring manpower and money into its own push to sew up early votes. Oregon’s elections are entirely by mail these days. Washington state also has eliminated traditional polling places in favor of mailed ballots, but residents determined to vote in person on Nov. 6 can go to a county election office. The rest of the states still offer traditional Election Day voting as well as some early option. Colorado, one of the presidential battlegrounds, has the most early birds. In 2008, nearly 80 percent of its votes were cast early and that’s expected to increase this time. In 34 states and the District of Columbia, people can vote early without giving any reason, in contrast to traditional absentee balloting, which was designed for those who will be away from home on Election Day, such as military members or college students, or are physically unable to go to a voting booth. Some states that ask for an excuse are so loose almost any reason will do, while others have kept strict rules limiting who can vote absentee. New England and Southern states are less likely to encourage early voting. It’s most popular in the West, where the trend got started in the 1990s. DOES EARLY VOTING INCREASE TURNOUT? Not necessarily. Giving people more time seems like an easy way to get more citizens to vote. But it’s not so simple. Some studies have found a small increase in total presidential turnout when it’s easy to vote early. Others found turnout actually dropped. Maybe some voters just procrastinate and end up missing the deadline. And potential Election Day voters might stay home if early voting drains excitement from the finale. For state and local elections, mailing ballots to all registered voters does bring an increase in participation, perhaps by reminding people about more forgettable elections. Presidential races are hard to overlook, so voting options don’t seem to make such a large difference. Once cast, an early vote is the bank. It can’t slip away because of a candidate’s misstep or an “October surprise” or a nasty new attack ad. Neither rain nor snow nor traffic jam can touch it come Nov. 6. A candidate holding back dirt on his opponent can’t afford to be coy much longer. By mid-October, significant numbers of voters will be locking in. Offsetting that, however: Early voters tend to be die-hard partisans, whose faith in their candidate is less apt to be shaken, political researchers say. Independents and undecided voters are more likely to vote on Election Day or just before. Despite what you might have heard, early voters traditionally are more likely to be Republican. Barack Obama’s successful push for early votes in 2008 created the impression of a Democratic phenomenon, and that idea’s been reinforced by court fights this year over changes to early voting rules in Democratic-leaning areas in Florida and Ohio. But 2008 was an aberration, McDonald said. Obama’s beefed-up early mobilizing effort benefited from infectious enthusiasm among young people and black voters for his campaign. Across the years, early birds tend to be older and better-educated and are more likely to be white than Election Day voters, he said, and they skew toward the GOP. About a third of voters cast their ballots early in 2008, and Romney’s efforts are likely to bump that up this year. Someday the notion of an Election Day may seem as quaint as giving a campaign speech from atop a tree stump. Maybe it’ll be Election Month or the six-week Voting Season. McDonald thinks that would be OK. But Burden worries that something is being lost. States with tight limits on absentee voting have higher turnout rates than states with prolonged, wide-open voting seasons, he said. That may be because in heavy early voting states, Election Day as a civic social event is disappearing.